Overeating any food can cause stomach pain from indigestion, but stomach pain specifically from eating cheese is most likely related to lactose intolerance. Stomach pain from eating too much cheese can also be related to a milk or mold allergy and should be assessed by your doctor. If it's the first time you've experienced stomach pain from eating too much cheese, wait and see if your symptoms subside. If this is a recurring symptom, see a physician for a clinical diagnosis. Overeating cheese with stomach pain is most likely the result of lactose intolerance. Cheese contains lower amounts of lactose, which is the sugar found in milk. This is why you may not develop stomach pain or other lactose intolerance symptoms if you eat a normal portion of cheese. The more cheese you eat, the more lactose you're consuming in one sitting. If your intestines don't produce enough lactase, the enzyme that breaks lactose down, you will develop stomach pain, gas, bloating and diarrhea within 30 minutes or up to two hours after eating the cheese. Indigestion occurs when you overeat or you eat foods that are high in fat or spices. Common symptoms of indigestion are fullness of the gut, pain in the middle of the chest bone or just above the navel, and burning in the throat. Sometimes indigestion can cause bloating and gas but is not associated with heartburn. Heartburn is a different condition. Indigestion can be treated with over-the-counter antacid and calcium supplements. Stomachaches and pain may also be a sign of a milk allergy. Cheese is made from milk and contains milk proteins that trigger milk allergies. A milk allergy will cause stomach pain because the allergic reaction causes inflammation and swelling throughout the digestive tract. Your immune system doesn't recognize the proteins in the cheese as safe, so it produces immunoglobulin E antibodies to fight them off. This leads to chemical reactions in the body that cause the mast cells in the soft tissue of your intestines to produce histamine. Histamine causes inflammation. Most cheeses contain mold even if it's not visible. Mold allergies are commonly associated with mold spores that are airborne and inhaled during allergy season. You can also experience an allergic reaction to mold by ingesting it. 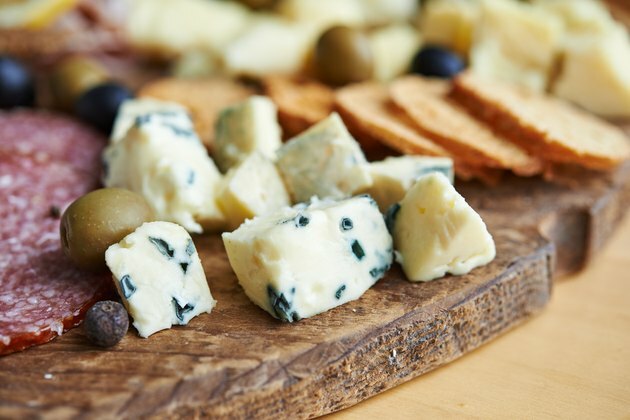 A mold allergy from eating too much cheese will cause stomach pain within a few minutes of eating it. How Many Calories Are in a Broccoli & Cheese Soup Bowl?